Big Bear Lake was made for boating. Well, actually, it was made to provide a reservoir of water or nearby agriculture, but it amounts to the same thing: a perfect place to sail, motor and splash. Southern California’s largest man made lake is seven miles long, 75 feet deep so it’s a great place to push the throttle or hoist the sail. Launch your own boat from one of the many public launch ramps. There are facilities on both north and south shore. You can pick up a license then rent just about any type of watercraft you can thing of from the one dozen different marinas that operate along the 22 miles of shoreline. Fishing tours, parasaiYou can also climb aboard the steamship for a lake boat cruise. If you're looking for a boating tour or better, a ship to rent for a party, you should inquire about the Pirate Boat from Holloway Marina. They have a party boat that is full of fun and don't forget your costumes. At least, your eye patch and bandana! 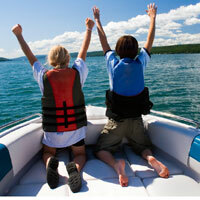 If a more quiet tour of the lake is your style, check out he Big Bear Queen boat tour from Big Bear Marina. You'll get the old riverboat feel at 7,000 ft. altitude.